The central location and accessibility of the 4 star Red Cow Moran Hotel on Naas Road in Dublin makes it a popular venue for National and International conferences and events. 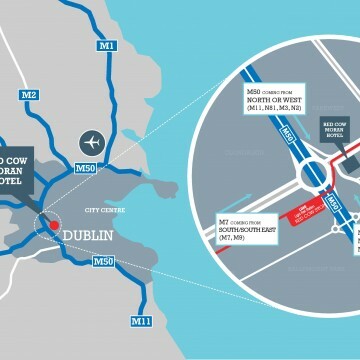 Located just off the M50 at the gateway to the Provinces with speedy access to Dublin International Airport, Heuston and Connolly Stations and from all parts of Dublin City and its surrounding Counties the Red Cow Moran Hotel is a convenient meeting point for corporate and social events. If you are attending an upcoming Conference or Meeting at Red Cow Moran Hotel we have compiled some useful information on the hotel to make attending the event the most enjoyable experience possible. The 4 star Red Cow Moran Hotel boasts 315 luxury guestrooms finished to the highest standards. Comfort is guaranteed and this is especially important after a long day of traveling to or attending an event. Delegates can relax and enjoy the multi channel LCD TV or catch up on some e-mails at the spacious work desk with complimentary high speed Wi-Fi. Each room offers fluffy duvets and hyper allergenic pillows for a great nights sleep and room service is available 24 hours a day. Check in time is 2pm on day of arrival and check out time is 12pm on day of departure. Early/Late checkout facility is available at a cost of €10 per hour, the hotel reception provides a complimentary luggage storage service where you can store your luggage before or after check in/check out. 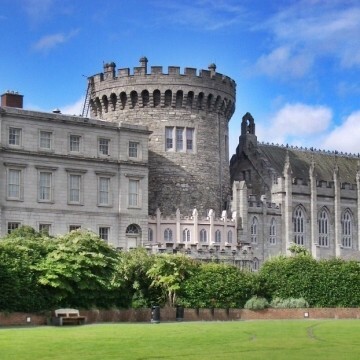 Dublin ranks among one of the top tourist destinations in Europe and offers visitors a variety of attractions and activities to suit all interests. If you are traveling to Dublin for a conference or event why not book to stay an extra night and enjoy all that Dublin has to offer. Red Cow Moran Hotel is the perfect base to Discover Dublin! We've got the best location at the edge of the city where the M50 meets the N7 Naas Road. Comfort is guaranteed and this is especially important after a long day of traveling to or attending an event. 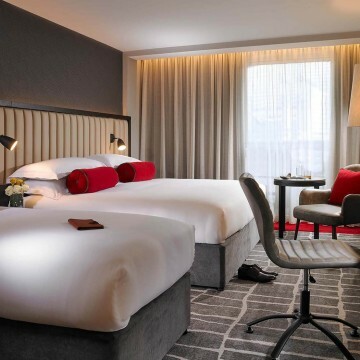 Discover Dublin from the comfort & convenince of the Red Cow Moran Hotel.